The Rowmark Ski Academy U18-21 team traveled to Jackson, Wyoming, for the Western Region FIS Elite races last weekend and came home with a long list of great results. Madison Ostergren was second for U18s (sixth overall) in the first giant slalom of the week and was atop of the podium in the second slalom. Park City’s Lexi Calcagni was seventh overall in the first GS and fourth overall in the second GS. Fellow Parkite Hannah West was third for U18s in the second slalom of the week and sixth for U18s in the second GS. Park City’s Megan Dingman took first for U18s in that second GS race (10th overall). Other top-10 finishers in that race were Liz Baer (seventh for U18s) and Riley Whitney (eighth for U18s). Another Parkite with a solid week of racing was Bea Gatta, who was fifth for U18s (sixth overall) in the first slalom and fourth for U18s in the third slalom. On the men’s side, Park City’s Gray Larsen was eighth for U18s in the first GS race and 12th in the second GS. 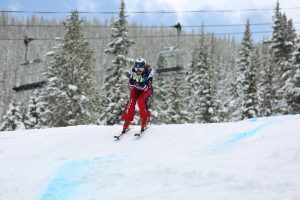 Luke Mathers took sixth in the second GS with a strong second-place finish for the U18s in the first slalom of the week. Matt Glasgow rounded out Rowmark’s strong performances with a seventh-place finish in the U18s in the final slalom.